Five years ago, Las Vegas went from having no good tapas in town to having two of the best Spanish restaurants in the country. This one just keeps getting better and better. Devotees of Julian Serrano and José Andrés have been known to cross banderillas over who makes the best patatas bravas. 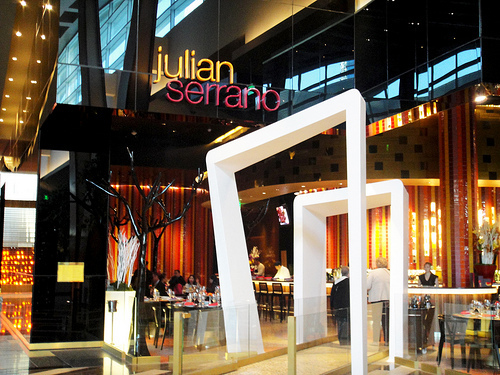 For my money, when I want the classic tastes of España, nothing beats a lunch or dinner at this Aria hotspot. When I want paella, I head to Jaleo. Serrano can get molecular to be sure—witness his ahi tuna on raspberry skewers—but the strengths of his menu lie with his huevos estrellados (fried potatoes, choriza, and eggs), traditional Spanish croquetas (fried chicken croquettes oozing béchamel sauce), and piquillo peppers stuffed with goat cheese. Other don’t-miss items include: the coca mallorquina (bready little pizzas covered with melted sharp Mahon cheese over spicy sobrasada sausage); the stuffed Medjol dates; and a layered Spanish tortilla that will take you straight back to Barcelona. A recent visit confirmed that not only has this kept its mojo going, but new menu items demonstrated a restless kitchen, still revamping and improving a small plates menu that was plenty strong to begin with. Serrano remains a master of all things foie (as in gras) and his spicy pork meatballs (and I mean spicy) and crab and avocado terrine show a culinary titan who is not afraid to innovate.They’re also serious about their sherry here, and the bar is constantly coming up with creative, killer cocktails. Favorite Dishes: Patatas Bravas; Coca Mallorquina; Ahi Tuna Raspberry Skewers; Spanish Tortilla; Stuffed Piquillo Peppers; Huevos Estrellados; Stuffed Medjol Dates; White Ceviche; Fried Calamari; Gazpacho; Apple Manchego Salad; Fisherman’s Soup; Avocado Crab Terrine; Pork Meatballs; Spanish Charcuterie Platter; Pintxo De Chorizo; Spanish “Pata Negra” Ham; Basically everything on the friggin’ menu except the paella.